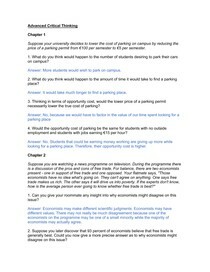 price of a parking permit from \u20ac100 per semester to \u20ac5 per semester. Answer: More students would wish to park on campus. Answer: It would take much longer to find a parking place. necessarily lower the true cost of parking? employment and students with jobs earning \u20ac15 per hour? looking for a parking place. Therefore, their opportunity cost is higher. (organized labour) but these impediments are unlikely to benefit the public in general. Supporters of policies to restrict free trade are promoting their own interests. 1. Is it likely that the EU will be better off if textile imports are limited by quotas? Explain. elsewhere is lower than in the EU. 2. Will anyone in the EU be better off if textile imports are limited? Explain. domestic textile producers and textile workers. increased trade but individuals in the affected domestic industry may lose. on the quantity exchanged is ambiguous. available information to help you buy something cheap and quickly sell it at a higher price? to its new equilibrium value before the amateur speculator can make his or her purchase. market&quot; with inside information? Why? when the information becomes known to all market participants. the quantity demanded of cigarettes has been reduced only slightly. to the tobacco industry will certainly rise. Is the president of your firm correct? Why? started to smoke in the future would not do so. more elastic because consumers can substitute toward other lower priced brands. place the burden of the tax on corporate grocery store chains and not on poor consumers.